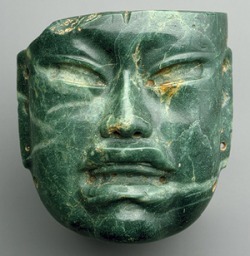 Perhaps the most interesting items that the Olmecs left behind are the giant heads that dot the landscape around their settlements across the Central American countryside. 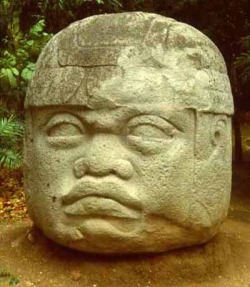 The mere existence of these massive heads are cause for wonder enough however, what is more shocking is that they seem to have slightly negroid features which suggests a possible connection between the old and new worlds thousands of years before the nation of Spain was even founded. Anthropologists believe that these heads are depictions of rulers and that they were used as a sort of altar where religious ceremonies took place in the rulers honor. 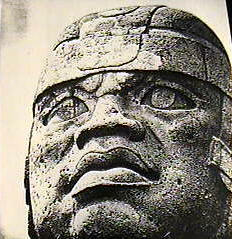 First the helmets that these heads are wearing are very similar to those warn by ancient peoples of Africa. 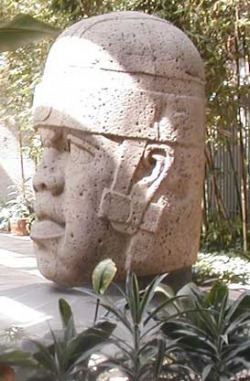 Second the shamans of the Olmec are purported to have resembled "dwarfish" negroid persons and the depictions of these shamans show traditional African symbols such as the snake which is a fairly common image in Mesoamerican art. Thirdly as the bottom head below shows there is a distinct line above the lips of the head that has been expertly carved in that is a genetic feature that is common among the people of Ghana. These arguments, they claim, prove that there must have been some sort of contact between the indigenous peoples of America and African sailors. There has been a great deal of controversy about these heads with many African groups claiming that these heads that show seemingly African features are evidence that there were great civilizations in Africa that were sailing around the world long before the Europeans. However, many established anthropologists think very little of this theory especially as they see very little evidence in support of it. 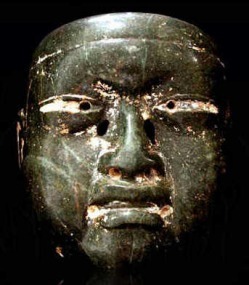 However, given the fact that the Africans would have had a shorter journey across the Atlantic and then up the South American continent than the Europeans it seems very possible that Africans may indeed have made it up to and influenced the Olmecs long before Columbus ever set sail.